The Winter Moth (Operophtera brumata) is an important pest of fruit and other deciduous trees. Wingless female winter moths emerge from pupae in the soil from October to January and crawl up trunks to lay eggs on the branches. 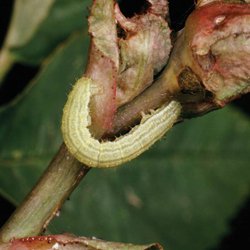 Eggs hatch in the spring and the caterpillars feed on foliage, flowers and young fruit, typically completing their feeding by early June. They then drop down onto the soil where they pupate.